I’m Olivier, and I presented the Open-Stage blender Production Challenges at last year’s blender conf. I would like to get your help for this year. – A way to distribute the challenge files faster. – Have more people sending in the challenge files before the conference. So, this post is all about the last point: I would like to get more files from you, blender users. Usually these challenge files come out from a problem that you had (or still have) during a production or image creation. They have a broad range: Something that weirdly behaves not the way you want or expect (no bug wanted here, it could be just a rig that maybe doesnt bend correctly even with rotation locking, or maybe something that you are stuck with, like how to change the color of an instanced group randomly. Other examples: you try to render an image, but an object doesn’t render correctly. I will not be able to show all files during the conference, and will have to do a selection of the most interesting ones. The ones that could start a debate or technique sharing. But possibly all will be shared somewhere online after the conf. The best format is a simple lightweight blender file, which focuses only on the problem. We do not want too many useless artefacts around. A bit like when you send a bugreport file, you squeeze it down to only the part that you are interestred in. For example if your challenge is about rigging, you do not need a complicated animated sculpted textured character. Ideally you should provide a text file (inside blend file or outside as .txt ) with the explanation of the problem (and your solution :p). You can append images if needed. And try to rate its difficulty level ( we need hard ones, as well as easy ones) I might re-edit them a bit + beware that they will be redistributed, so be sure to provide only content that is not afraid to be copied around the world wild web. If possible size should be reasonable. In this post I will share the files I used for my presentation called blender challenges. This was one of my best conference, if not simply the best! Got the chance to meet a lot of new people, especially some swiss guys this time too! 🙂 Hope we can do some gathering one day soon. Apart from meeting people (which takes some time and even makes you miss some talks because chatting and sharing is so much fun) you also get the chance to see talks and presentation of techinques, researches or simply showcases of what people do with blender. I had the chance and task to host the open-stage time slot, and so decided to share some files and problems encountered during some productions, but in a simplified way. It resulted in a series of 6-7 .blend files, with something wrong in them, and people would need to solve them. The files were handed out at start of the talk, and folks had to gather in groups and try to solve them. The few first ones were rather easy, ranging from bad oriented normals, to overlaping faces. some others were a bit more tricky. The audience was very participative and it started some nice discussion and trick sharing, I loved it. Instead of giving out the answers, I will give out the files for your pleasure and you can try to solve them. Can you solve them ? Do you have some answers ? I just came back from Stuttgart where I attended the FMX 2011 conferences. First of all let me tell you it was amazing! Not only where the conferences interesting, but also well attended and often full. I did miss some because of that. 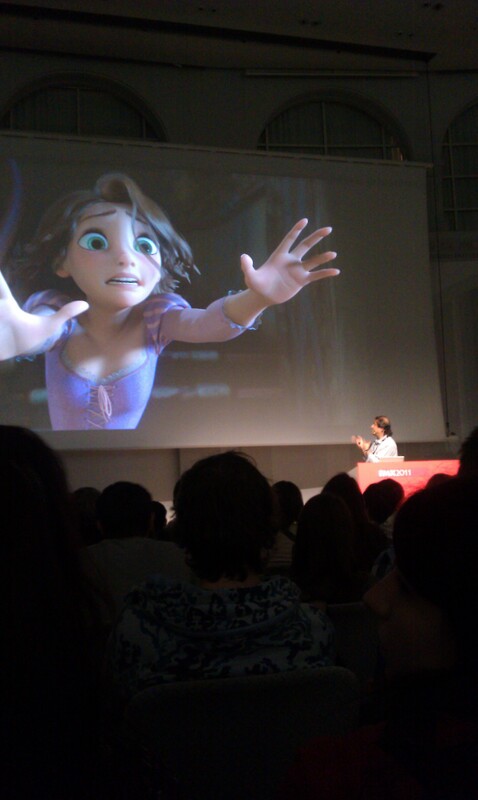 But well, on the other hand I also saw some great ones like Disney’s presentation on Tangled/Rapunzel lightning and shading, or Pixar’s cinematography (layout & camera) . Special effects were also not forgotten with nice sessions around Harry Potter’s movie and some stereoscopic 3d workflows. The House der Wirtshaft building is a great place to hang around and has good installations. I just wish I could duplicate myself using Shift-D so I could see all the talks and workshops. 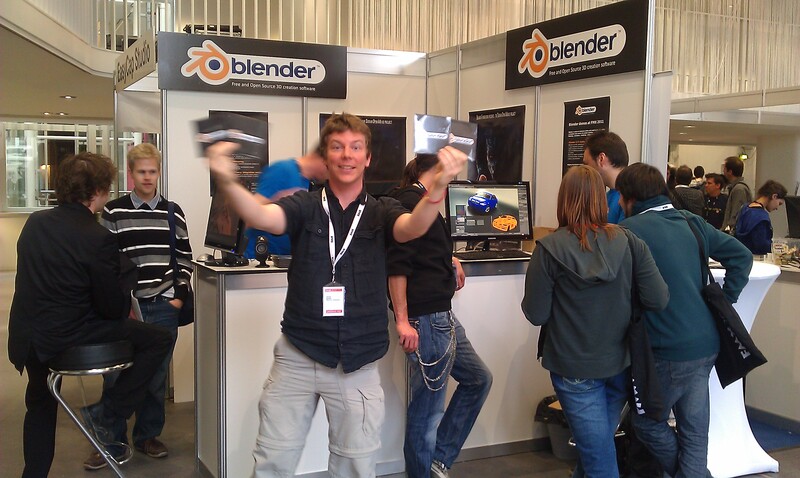 A large part of my time was also spend revolving around the Blender booth were we gave out nearly a thousand free DVD’s of blender + tutorials to interested people. 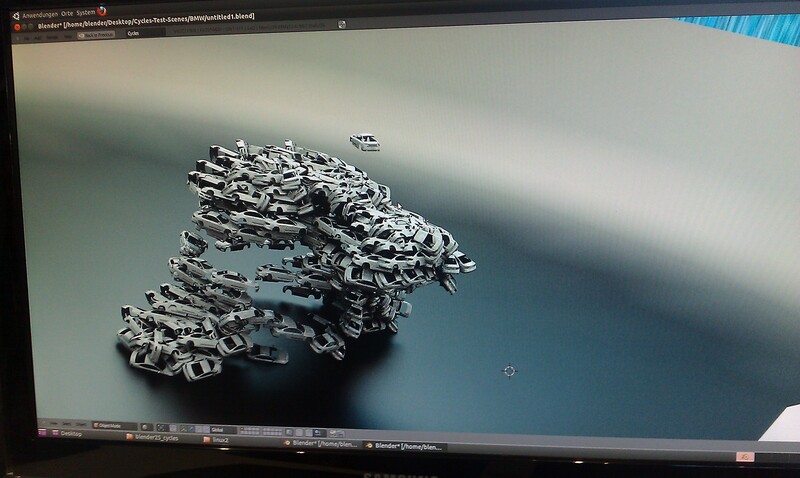 I was suprised at the number of people who actually had tried blender few years ago and are still interested. A fun question to be heard : “How can it be free and so powerful? Who pays for all this ? “. We gave some demos and had some afterhour beers. I was very happy to meet Ton again, and of course all the german blender users/guru and say hello to all you guys ! Especially big hug goes to Thomas W who was a great after-work-dinner-relaxation-chill-out-evening organizer. Taking us to typical schwäbische restaurant on first night, and exotic african on the 2nd day. + thanks for the hosting. The big attraction (and it really did attract people) on the booth was indeed Cycles, the new render engine work-in-progress. It was my first time see it live, and got a good chance to play around with it. Mostly turning around the viewport and staring at the scene rendering. We did show a lot the BMW scene from Mike Pan (and I enjoyed changing it live) , and it was fun because a few booth away was Cad Networks (reseller of rendering and vizualization solutions Nvidia partner) and they were showing off some real-time raytracing, but to be honest the speed difference beetween their powerhorse and our modest setup was not big… Of course a lots of parameters has to be taken in account, they use windows (cycles seems 2x faster on linux (due to no win optimization yet i think) and their software to demo is different. So we managed to get cycle win build on a usb stick and plug it in. It was cool and working, but it seems it did not use all the 4 graphic cards in parralel, only one… So we still have to wait to see full parallel CUDA. The engine also integrates a new shading system based on OpenShading Language (opensource project from Sony). It has some basic shaders that can be viewed in nodes or as property list. More complexe shaders to be added later, or you can create/program your own ones. I will definetly be at FMX 2012 next year. cars, cars, cars....modern art ? 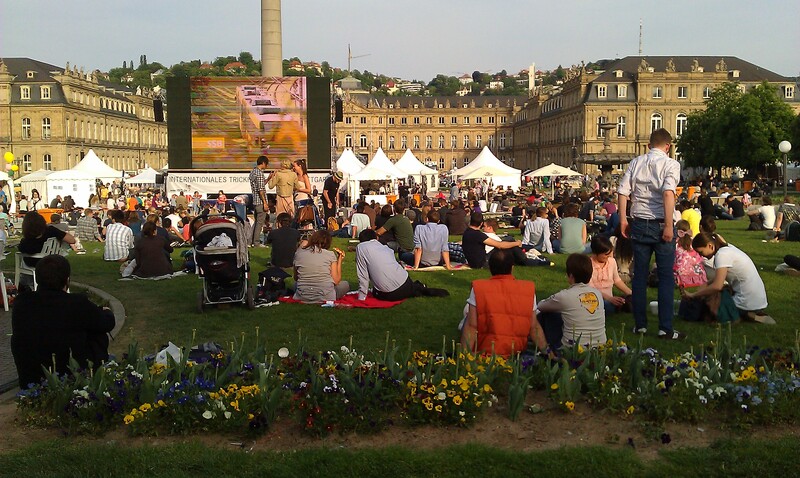 Stuttgart was also hosting the International Animation Festival- With open air screenings ! Let’s meet at the Blender Conference! I would like to tell you that i will be at the blender conference in amsterdam and i will be happy to meet all artists that would like to meet me. I will be there with 2 collegues from RGBprod studio, including my apprentice Andres. Last year was my first conference and i did meet some very nice people, some with whom we worked together so i want to be sure to reiterate this year. 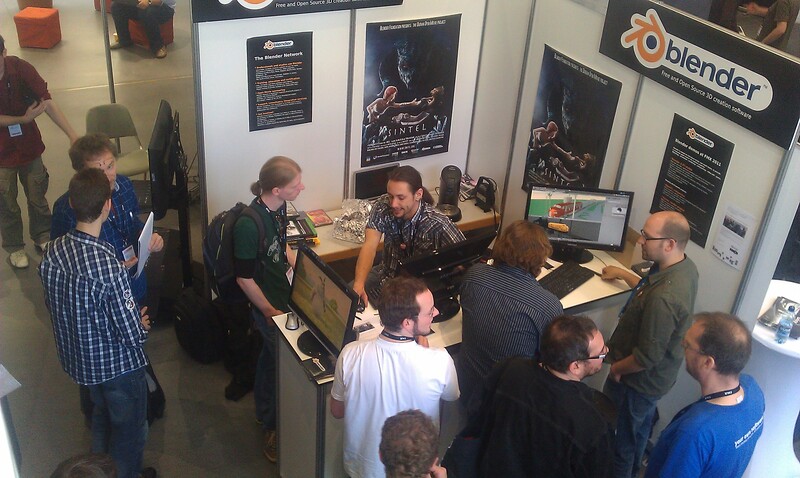 But of course i will be happy to meet lots of people, you can check what we do in the portfolio & demo section. so let’s meet there 🙂 feel free to contact me for a chat rendez-vous. They both work on some project of animatronic using blender as a tool to control servo motors, all this to animate some real object faces. They did a great demonstration animating in blender, and then playing back on 2 objects, one head (4 servos, up/down,left,right, mouth movement and eyes) talking to a fan (3 servos, up-down,left-right, and fan speed) adding some funny speech in the sequencer, the effect was amazing. I hope i can post a video of it soon. 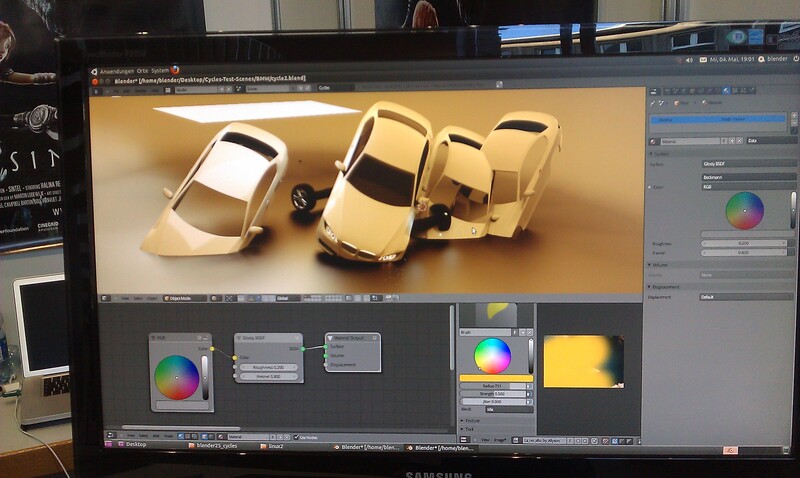 Andrey showed how easy and nice it is to rendering using Vray. I am really definitevly going to investigate it. I also really hope he can make it to the blender conference this year. Other great people include Igor and his good architecture classes, lots of small tips and shortcuts or tips i learned. And Michael, a young designer/animator who did a good masterclass on rigging a mechanical machine, including the chains. I think all these videos will be online after the end of blendercamp. Oh and i should not forget the talented teenager Luba, that showed us great models of dinosaurs,horses and panther, textures and animations. Oh and the great flying dragn. She is the future of blender artists. Unfortunately we could not communicate much as my russian is limited to saying thank you and asking where the bathroom is 🙂 I should not forget all the other people attending and making the camp so cool, i will definitively come back next year. 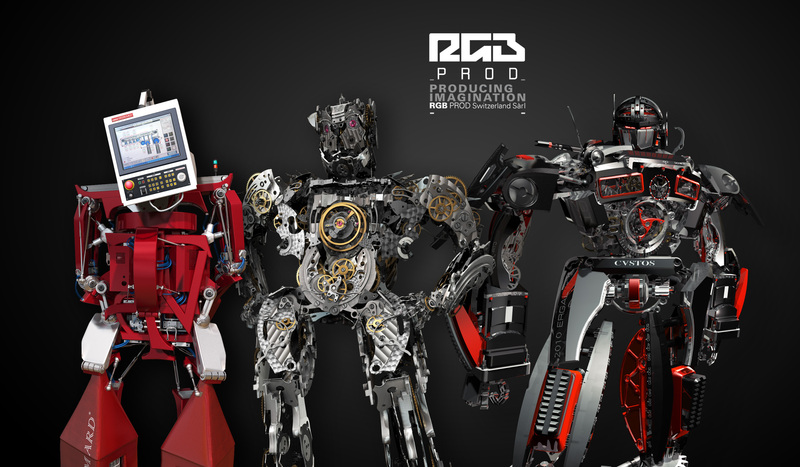 Oh and on my side i did show some making-of and production workflow of the H7 robot and New Ingenia movie.